Students use plastic eggs to practice their Punnet square-solving-skills. (This example uses incomplete dominance - i.e. Bb appears green, not blue, as it would in a straight dominant/recessive situation). The eggs have been mixed and matched to create various genetic crosses. 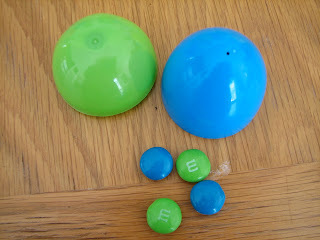 For example, a blue half matched with a green half would represent BB x Bb. Students use a Punnet square to solve the cross, and then open the egg to check their work. This activity has nothing to do with Easter, but the eggs are only available at that time of year. Check your local grocery store, big-box store, drugstore, etc. at the end of the month for eggs on clearance. Get them now, and you'll have them for whenever you want to do the activity. 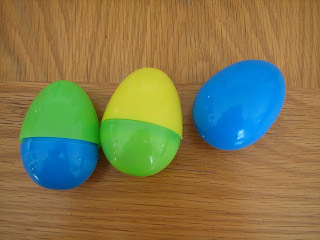 The original activity, Easter Egg Genetics, is part of the Access Excellence Activities-To-Go Collection. If you visit the original, you'll find a guide for filling all of the various egg combination, which will save you a few minutes of precious time. http://www.middleschoolscience.com/ has a student worksheet to accompany the activity (and she also includes the egg-filling guide with her teacher notes), which can be found here. You can fill the eggs with appropriately colored candy, which is a lot of fun if you are giving each student one (or maybe 2) eggs as a quick assessment. If you want each student to work their way through more eggs (and you don't want the hassle of refilling the eggs), use appropriately colored objects - counting chips, pieces of construction paper, centimeter cubes, etc. The students can replace the objects after they check their work and you're all set for next time.